The most interesting phenomenon in this route stage is the group of rocks called Kolovratske stijene, offering a wonderful view towards the sea. The rocks of Kolovratske stijene extend south of the group of Samarske stijene and Bijele stijene, as a solitary ridge on the very edge of Velika Kapela, where the mountain's slopes begin descending towards the sea. 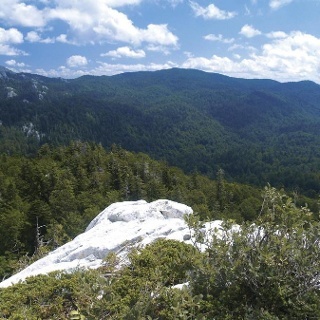 The rocky peak area of the ridge of Kolovratske stijene is approximately one kilometer long. Among hikers, Kolovratske stijene are not so well known, since the rocks of Bijele stijene and Samarske stijene are much better known, taller and more beautiful. However, the charm of Kolovratske stijene lies precisely in the fact that they are solitary and close to the sea. From the Zelena kuća mountain shelter, trail markings first briefly follow the road, and then a steep climb begins to the pass below Kolovratske stijene. On the other side of the pas, the trail steeply descends to the asphalt road. Once there, we can choose between the Kapela – Velebit connecting trail to the left (8 hours of hiking to Vratnik) and the continuation of the markings of the Kapela Hiking Trail to the right, along the road, in the direction of Vinište and Klenovica. Hiking trail markings along what used to be the connecting trail Kapela – Velebit are no longer maintained, so extra caution is required. However, orientation is not so difficult. In continuation of the route, we need to follow the road direction towards the south and the west, leading to the village of Alan. From that village, the route continues further south along the wider road for 4 kilometers to the village of Krivi Put, where there is a mountain shelter. From Krivi Put onwards, we follow the marked Senj Hiking Tour (Senjska planinarska obilaznica) towards the mountain pass of Vratnik that marks the beginning of the mountain of Velebit. Mostly easy walking on roads and forest trails. Very badly marked section but mostly easy to follow roads with map and gps. Trail coming down from Koloratske stijene overgrown. Skip the second peak (unnnamed) altogether - nice views over the sea, but the trail is pretty much nonexistent and hard to follow, not worth it. At the guest house took the bike trail to the right - it's longer but quicker since it goes around Alina Bilo. Couldn't check water in Krivi Put since two big dogs from the neighbouring house almost attacked me as I walked past the shelter. Again, on the forest trail before getting to the highway ran into a shepherd whose two big dogs also came at me very aggressively. Don't know if he's always there, but watch out for dogs anyway. One of the worst marked section of the trail will bring you to some guesthouse and you'll find yourself at some swimming pool (see also notes from Romines in earlier comment). Just before the guesthouse there is a barred forest road on the right. We ignored the blockade and could walk around til Krvi Put along the coast (nice view on the sea!). Handy if you have a smartphone app like Outdooractive or MAPS.ME to find your way. Hopefully this error gets fixed soon. Climb to Kolovratske Stijene quite well marked, but overgrown. Keep looking at your gps. From Stijene bit worse, after trail splits between Velebit and More, no more markings ( or very few), but it was easy to follow the roads (of course with looking at map and gps). At crossroad Duboko we chose to follow local cycle trail (blue 14) which goes around Alino Bilo on the west side. Easy and still very nice alternative to get to Krivi put. Well behind school in Krivi put, building in horrible state. Hiking along nice quiet roads to Vratnik, ruined houses with few accessible wells. Difficult hitch to Senj, as we are group of 3 we decided to reserve Autotrans bus (stop at Konoba Putnik - 700 m east from the pass, you have to wave at the bus to stop). Senj good place for rest and resupply.